Getting to know your neighborhood is half the fun! All seven of our Deep Ellum Loft locations, 3200 Main Lofts, Adam Hats Lofts, Continental Lofts Elm Street Lofts, Farm and Ranch lofts, Futura Lofts and The Murry Lofts, are conveniently located in the middle of the Deep Ellum neighborhood, one of Dallas's most diverse and eclectic walkable historic neighborhoods. When you live in Deep Ellum Lofts, you are within walkinig distance to a plethra of entertainment and restaurants. 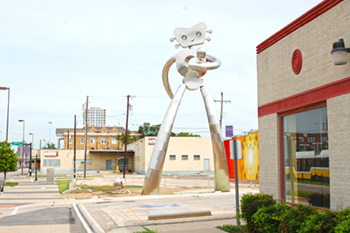 Deep Ellum is home to creative public art, murals and art galleries, such as the fantastic Travelling Man sculptures found throughout the neighborhood. Deep Ellum hosts the Deep Ellum Arts Festival, which transforms six blocks of the neighborhood into one incredible street festival. 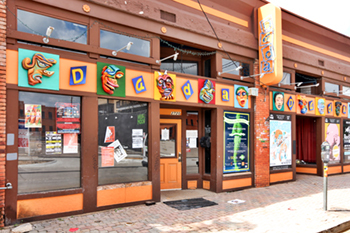 Deep Ellum thrives on their eclectic blend of art galleries, music venues, bistros, craft beers and bars - such as Deep Ellum Brewing Company - and destination nightlife scenes like Amsterdam Bar, Black Swan Saloon, and the famous Club Dada. The fun and entertaining music venues, like Trees and The Door, always bring the best Indie bands to town. The Deep Ellum neighborhood never fails to hit the spot when it comes to your culinary cravings. With a variety of eateries ranging from upscale to adventurous, within walking distance from your new home. Indulge in your All-American favorites from Uncle Uber's Sammich Shop, thin crust pizzas from Cane Rosso, Cajun favorites from The Free Man Cajun Cafe or have breakfast at any time of the night at Buzzbrews and Cafe Brazil. For more international flavors, there's the fresh authentic Mexican fare at Maracas Cocina Mexicana, the premier Vietnamese restaurant Lemongrass and the always satisfying sushi bar, Deep Sushi. The neighborhood is also home to the several vintage boutique stores. You can have it all just blocks away from your new home!